-young is obvious. he’s their new star. -baze is a prototypical 3&D player. started at the 2, but i think he can move over to the 3 and be just as effective. -prince started at the 3 but i think he can be like RHJ, a small ball 4. one BIG difference though is that prince can handle the ball better and is a WAY better shooter. -collins looks like a beast. not great size at 6’10” but he’s fast, athletic, plays above the rim and can shoot the corner 3. he started at 4 but i suspect this season we will play 4 out and he moves to the 5. -dedmon started at the 5 but i can see him get pushed to back up 5. last year showed he can hit the 3. -huerter is a good shooter and attacks the rim. reminds me of a young parsons. -spellman is a stretch 4. -bembry is a young wing. attacks the rim and ok shooter. -muscala and plumlee are vet bigs. last but not least schroder still has to get traded so who knows who else they might get? Same feeling here. Their 3 1st round drafts from this year are particularly exciting. All three are excellent 3pt shooters. (And one of them is fond of logo shots from time to time.) There are so many coverages on Young, so I’ll pass him. I will only want to learn more about all players until training season and more readily in preseason games. For now I’ll hold a wait and see…. After all, they are all NBA level talents. Last year that Collins boy was balling. He is a real deal in the years to come. It seems the SF Prince also is quite a dynamic player. As long as the Hawks are dedicated to compete hard, they definitely can surprise people. Looks like those “weaknesses” are all trainable pretty minor things. One common theme from this years draft picks is 3 pt shooting. trae is an absolute bomber, huerter is a good shooter, and spellman is a stretch 4.
collins, baze, prince, even dedmon can all shoot the 3. coming from the gsw organization, it’s no wonder that 3pt shooting is so highly valued. last but not least, schroder’s awful 29% 3p% is one of his greatest weaknesses. forget all the drama about his attitude and legal issues. he plays no defense and cant shoot threes, no wonder they used up most of their cap space on lin! Sean Marks plans to build a team of chuckers throwing up shots at high speed. What is the difference between Lin’s first year with Brooklyn and Lin’s first year with Atlanta. Lin is having a much better team in Atlanta; the team is well balanced at both ends of the court and teammates are more competitive and more talented. Atlanta can rebuild from draft choices while Brooklyn couldn’t. Whether Atlanta is a better team for Jeremy could be solved by comparing the first season of Lin with the team. I surely can bet on Lin having a better season in Atlanta than in Brooklyn. I rest my case. Taurean Prince SF (24) – 2nd year with improvements in every year. Dewayne Dedmon (28) C – 5 year veterans with his career year last season, 7 footer that can shoot 3s. All except Plumlee can shoot 3s. They won 24 games last season with Dennis Schroder as PG. How much improvement the Hawks can make this season with the addition of Jeremy LIN and 3 rookies? I like the starting lineup a lot. This team can certainly improve with veterans like Lin, Bazemore, Dedmon, with young players like Collins and Prince. Trae Young definitely can’t lead veterans like Dedmon, Bazemore and Lin. Lin can’t be the mentor if Trae Young starts so Atlanta will defeat its purpose to acquire Lin. I figure Lin will start. So happy new season! Couldn’t wait for training camp. Before long, the first prediction from CBS of this team comes out. 35 wins; an improvement of 11 wins next season. 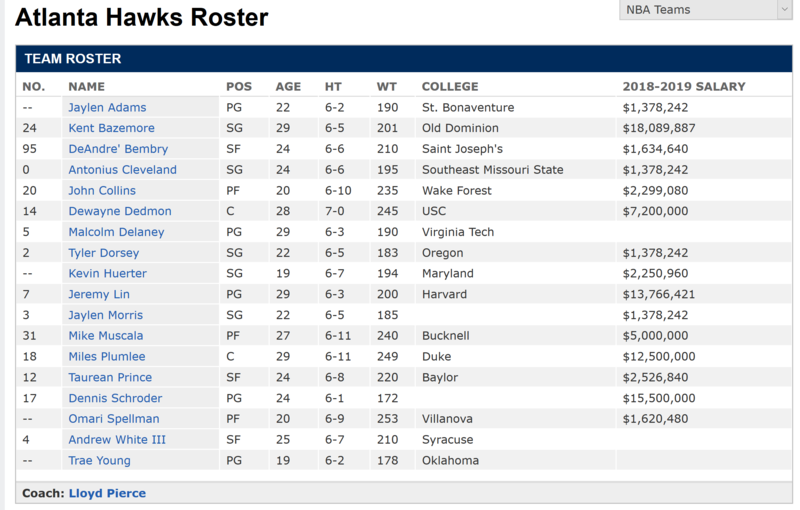 With the addition of Jeremy Lin, Alex Len, the coming back of Bazemore, Dedmon, Prince, Collin who have just had career years, not to mention the addition of 3 exciting rookies; all first rounders and the return of Tyler Dorsey. Atlanta surely has made the new coach’s job easier with these 10 players days in days out; a chance to make the playoff in rebuilding. Dedmon (Hawks starting center) has an inspiring story, similar to Lin’s. Except, Dedmon started playing basketball at a much older age compared to Lin. This dude is a hard worker and will most likely get along with Lin just fine. Atlanta Hawks posted this on twitter for NBA Dunk Week. They have dunkers on this team – looks like a fun bunch! Bazemore, Prince, Dedmon, especially Collins, gets up there. Gotta get rebounds and steals for those fast break jams! It’s only Summer League. But, some John Collins highlights from Summer League. Based on this one minute video, guy seems to have skills. Can shoot the three, play in the post, can pass, and roll hard to rim. Plays defense – nice block. Also notable in these highlights. The guards all seem unselfish, even in summer league. Trae Young, Tyler Dorsey, Robert Johnson (not on roster). All willing to pass and move the ball, instead of dribbling and dribbling. Ty;ler Dorsey highlights from Summer League. Can pass, drive to rim, shoot long 3’s. Nice. Travis Schlenk interviews at Hawks Summer League. Before trades for Lin and trading away Schroder. A lot of usual GM-speak. Definitely sees Trae Young as future. But seems more transparent when discussing players’ strengths and weaknesses. First one was at Utah SL, just talked about Young and Collins. Second one was at LV, talked about more players like Huerta. NBA Scouts grading Trae Young on his strengths and weaknesses, after Summer League. Not surprisingly, as a one-and-done, quite a few areas of improvement. Turnovers, defense, shot selection. But also lauded for his court vision and passing. Then again, what do those “scouts” know? LOL. After Summer League, another review of Trae Young’s strengths and weaknesses. Also comments by Travis Schlenk. What I notice difference between Schlenk and Marks. Marks always spoke in generalities, eg. “he makes his teammates better”, or “he’s a hard worker”. Schlenk seems to be willing to be more direct and to share his insights. Isn’t this also one of Lin’s strengths? Those young players are entitled to their mistakes on court but I still think the veterans, Bazemore, Lin and Dedmon will carry the team next season. Jae Joc podcasts. I believe he happens to be Asian-American. I have listened to the latest 2 or 3. So far, I like the guy. Seems genuinely knowledgeable about the Hawks. Not over-the-top hyperboles or homerism. Even-toned. NO screaming – lol. I learned something about the Hawks players in latest episode 15. If anyone has the time, give him a listen. Thanks for the podcast suggestion. The other two Hawks podcasts I’d sampled were lame. I’ll definitely check on this one every week or so. Thanks for the post. Just came back after learning about Lin’s trade. Some background on Alex Len signing. Lin – Len, gonna be fun listening to Dominque Wilkins get all confused. “(Fans) can expect a lot of intensity, a lot of dunking.,,, It’s about setting great screens and rolling hard to the rim, that’s going to open up shots for Trae and plays for guys around him… ” Sounds like Ed Davis’ MO. But, no mention of Lin. Justin Anderson acquired as part of Melo trade. Played in Sixers’ playoff games last season. Sounds like a guy with a good attitude. Mentions at the end that he expects to be 6th man? Sports Illustrated article comparing the Hawks and the Mavericks potential next season. Because of the Hawks decision to give up Doncic to draft Young. Not everyone is on the bandwagon of either player yet. But here’s one evaluation of Young. Not surprising, Young is a one-and-done 19 year old rookie. Still hoping JLin will come back and get it done for the Hawks, whether they like it or not. Trae Young doing a bit of self-promotion. Confident? Or egotistical?